Pollitt offers a perspective emerging from the encounter between sign languages and alphabetized languages. The examples illustrating this chapter are drawn from the challenge of translating sign language poetry, or ‘Signart’. The densely semiotic, three-dimensional nature of Signart increases the demand on translators to expand their intersemiotic range in order to achieve successful translation. 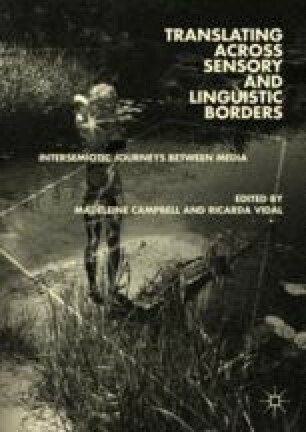 Given here as case studies, Pollitt’s experimental intersemiotic practices harness the semiotic resources of various communication modes and materials. Situated in relation to a number of contemporary translation theories, this chapter explores the new meanings that are made available by these alternative translational practices. Pollitt suggests intersemiotic translations of Signart can engage new audiences in different ways, thereby developing new social and cultural forms of communication beyond traditional translations of Signart. Emmorey, Karen. 2014 “Iconicity as Structure Mapping.” Philosophical Transactions of the Royal Society B (Biological Science). The Royal Society. https://doi.org/10.1098/rstb.2013.0301. Humphries, Tom, Poorna Kushalnagar, Gaurav Mathur, Donna Jo Napoli, Carol Padden, Christian Rathmann, and Scott Smith. 2015. “Discourses of Prejudice in the Professions: The Case of Sign Languages.” Journal of Medical Ethics. http://jme.bmj.com/content/early/2017/03/09/medethics-2015-103242. Accessed August 14, 2017. Parish, Nina, and Emma Wagstaff. 2017. “Poetry’s Forms and Transformations.” Call for forthcoming special issue of L’Esprit Créateur. translating.hypotheses.org, with reference to frenchpoetryand.wordpress.com. Online call accessed 5.8.17, volume in press as at 26.02.18.